Citation: C N Trueman "Romulus and Remus"
Romulus is given the credit for founding Ancient Rome – so legend has it. Children in Roman schools were taught the story and it became almost set in stone. What is the legend of Romulus and Remus? Romulus and Remus were twin brothers. They were abandoned by their parents as babies and put into a basket that was then placed into the River Tiber. The basket ran aground and the twins were discovered by a female wolf. The wolf nursed the babies for a short time before they were found by a shepherd. The shepherd then brought up the twins. When Romulus and Remus became adults, they decided to found a city where the wolf had found them. The brothers quarrelled over where the site should be and Remus was killed by his brother. This left Romulus the sole founder of the new city and he gave his name to it – Rome. The date given for the founding of Rome is 753 BC. This story, of course, is only a legend. The actual growth of Rome is less exotic and interesting. The city of Rome grew out of a number of settlements that existed around seven hills that were near the River Tiber. The settlements were near the river for the obvious reasons of a water supply. The Tiber was also narrow enough at this point to be bridged. However, the area also suffered because of the nearness of the river. Each settlement was separated from the other by marshland. Each individual settlement was vulnerable to attack as a single settlement. By joining together they were stronger. To join together, the marshland had to be drained. This was something that took years to do. 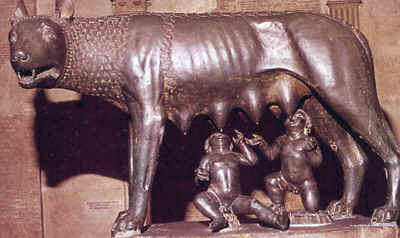 The legend of Romulus and Remus gives the impression that Rome was created very quickly; the truth was very different. The early people of Rome were from a tribe called Latins. They were from the Plains of Latium. The Latins were successful farmers and traders and they became rich and successful. Therefore, Rome from its early days was a rich city. This was to create jealousy and to bring the city of Rome into conflict with areas surrounding the city. In particular, the Romans fought against the Etruscans and the Samnites. For this reason, the leaders of Rome invested in an army. This skilled force both protected the city and expanded its power. By 300 BC, the Romans controlled most of the Italian peninsula.